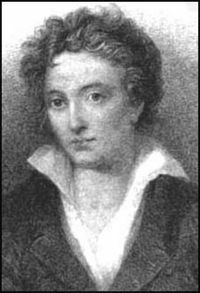 Shelley's "Ode to the West Wind" is one of the most famous poems ever written. Keat's "Ode on a Grecian Urn" and "Ode to a Nightengale" are two odes that represent the romantic period of poetry. Ode (Classical Greek: ὠδὴ) is a form of stately and elaborate lyrical verse, generally written to honor or praise some entity or force of nature. A classical ode is structured in three parts: The strophe, which sets the scene of the poem or states a proposition; the antistrophe, which adds commentary or counterargument; and the epode, in which the conflicting currents of the strophe and antistrophe are harmoniously resolved. In ancient odes, each of these three components would have its own unique stanza-pattern and rhyme-scheme, and all three would recur, in sequence, until the ode had reached its final conclusion. The ode was invented by Archilochus, but it truly came into its own with the unparalleled odes of Pindar. Pindar's odes were so technically masterful and intricate that, for centuries afterwards, few Greek authors used the form and those who did were generally derided as inferior. Although the ancient Romans adopted the form from the Greeks, the odes of Latin literature are considerably different from their Greek counterparts. Latin odes were written in a simpler form that preserved the function of the ode while loosening or abandoning most of its more demanding technical requirements. Many centuries after antiquity, European poets, beginning with Ronsard, attempted to revive the ode as a verse-form. It would not be until the Romanticism of the nineteenth century, however, that truly masterful odes written in European languages would begin to emerge, such as those of Victor Hugo in French and the unparalleled odes of John Keats in English. Since the nineteenth century, the ode has made and continues to make occasional reappearances in Western poetry, but it remains one of the most daunting and technically challenging of all forms. There were two great divisions of Greek poetic song: First, the personal utterance of the poet, and second, the choral song of his band of trained dancers. Each of these culminated in what have been called odes, but the former, in the hands of Alcaeus, Anacreon, and Sappho, came closer to what modern criticism knows as simply lyrical poetry. On the other hand, the choir-song, in which the poet spoke for himself, but was always supported, or interpreted, by a chorus, led up to what is now known as the ode. Stesichorus, Ibycus, and Simonides of Ceos led the way to the two great masters of the ode among the ancients, Pindar and Bacchylides. The form and verse-arrangement of Pindar's great lyrics have largely defined the ode ever since. It is now perceived that Pindar's odes are consciously composed in very elaborate measures, and that each is the result of a separate act of creative ingenuity, while preserving an absolute consistency of form. The Latins themselves seem to have lost the secret of these complicated harmonies, and they made no serious attempt to imitate the odes of Pindar and Bacchylides. It is probable that the Greek odes gradually lost their musical character; they were accompanied on the flute, and then declaimed without any music at all. The ode, as it was practiced by the Romans, returned to the personally lyrical form of the Lesbian lyrists. This was exemplified, in the most exquisite way, by Horace and Catullus; the former imitated, and even translated, Alcaeus and Anacreon; the latter was directly inspired by Sappho. The earliest modern writer to perceive the value of the antique ode was Pierre de Ronsard, who attempted with as much energy as he could exercise to recover the fire and volume of Pindar; his principal experiments date from 1550 to 1552. The poets of the Pleiad recognized in the ode one of the forms of verse with which French prosody should be enriched, but they went too far in their use of Greek words and crude archaisms. The ode, however, died in France almost as rapidly as it had come to life and came to an end with the conclusion of the sixteenth century. Early in the nineteenth century the form was resumed, and the odes composed between 1817 and 1824 by Victor Hugo, the philosophical and religious odes of Lamartine, and the brilliant Odes funambulesques of Theodore de Banville attest the ode's resurgence into European literature. The golden age of the German ode is associated with the late eighteenth century and writers such as Klopstock and Friedrich Schiller, whose An die Freude (Ode to Joy) famously inspired the final movement of Beethoven's Ninth Symphony. The German ode inspired the first Russian odes, written by Mikhail Lomonosov, notably Morning Meditation on the Greatness of God and Evening Meditation on the Greatness of God on the occasion of the Northern Lights (1742-44). But the most popular and enduring Russian odes were composed by Gavrila Romanovich Derzhavin during the reign of Catherine the Great. His ode On God, often regarded as the greatest piece of eighteenth century Russian poetry, was translated into French fifteen times and into German eight times during the poet's life. The initial model for English odes was Horace, who used the form to write meditative lyrics on various themes. The earliest odes in the English language, using the word in its strict form, were the magnificent Epithalamium and Prothalamium of Edmund Spenser. In the seventeenth century, the most important original odes in English are those of Abraham Cowley and Andrew Marvell. Marvell, in his Horation Ode on Cromwell's Return from Ireland, used a simple and regular stanza (aabb, two four-foot lines followed by two three-foot lines) modeled on Horace. Cowley, however, wrote "Pindarick" odes which had irregular patterns of line lengths and rhyme schemes, though they were iambic. Although the principle of Cowley's Pindaricks was based on a misunderstanding of Pindar's metrical practice, it was widely imitated, with notable success by John Dryden. Pindar's meter was better understood in the eighteenth century, so the fashion for the faux Pindarick odes faded, though there are notable "actual" Pindaric odes by Thomas Gray, The Progress of Poesy and The Bard. The Pindarick of Cowley was revived around 1800 by Wordsworth for one of his very finest poems, the Intimations of Immortality ode; irregular odes were also written by Coleridge. 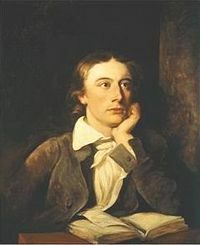 Keats and Shelley wrote odes with regular stanza patterns. Shelley's Ode to the West Wind, written in fourteen line terza rima stanzas, is a major poem in the form. But perhaps the greatest odes of the nineteenth century were written by Keats. After Keats, there have been comparatively few major odes in English. One most notable exception is the fourth verse of the poem "For the Fallen" by Laurence Binyon, which is often known as "The Ode To The Fallen" or more simply as "The Ode." A musical setting of a poetic ode is also known as an ode. Horatian odes were frequently set to music in the sixteenth century, notably by Ludwig Senfl and Claude Goudimel. Dryden's "Ode on St. Cecilia's Day" was set by Handel, and Schiller's "Ode to Joy" was used in Beethoven's Ninth Symphony. Odes to dignitaries were often set also, such as the Ode for the Birthday of Queen Anne by Handel. Byron's "Ode to Napoleon Bonaparte" was set by Arnold Schoenberg. ↑ Thomas Gray, The Progress of Poesy. Retrieved September 12, 2007. ↑ Thomas Gray, The Bard. Retrieved September 12, 2007. This page was last modified on 23 June 2008, at 23:41.